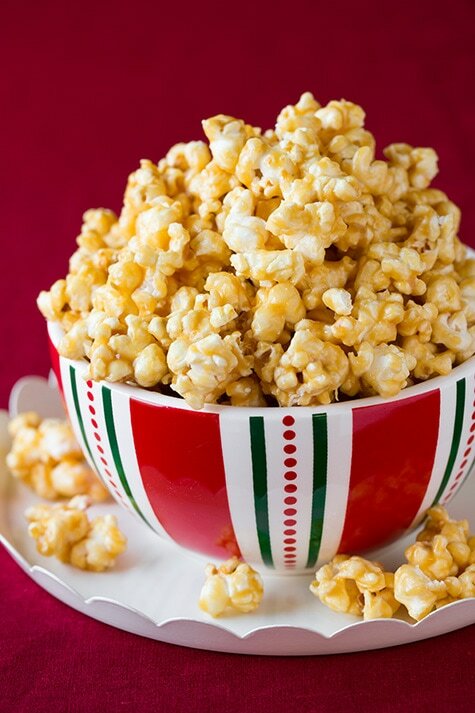 Caramel Popcorn is one of the greatest parts of the holidays! It’s the ultimate party snack food and the perfect gift to share with others as it’s basically guaranteed to be thoroughly enjoyed. This version is chewy, perfectly sweet and nicely balanced with hints of salt. 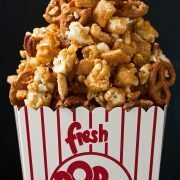 This caramel popcorn isn’t just any ordinary caramel popcorn, this is a chewy (kind of sticky), salted caramel popcorn. 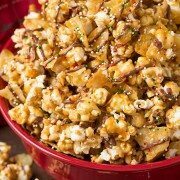 The sea salt in this recipe takes caramel popcorn to the next level of deliciousness, it ads a gourmet touch. I love both types of popcorn, the chewy and crunchy, but I think I favor the chewy a little bit more. It reminds me of my Grandma because she made it all the time, especially during the holidays. Light brown sugar – adds a richer flavor than white sugar would. Unsalted butter – gives it that classic buttery richness. Corn syrup – gives the coating a good consistency and keeps it from crystalizing. Fine sea salt – adds that classic lightly salted caramel flavor. Reduce amount if desired for less salty taste. Sweetened condensed milk – adds a delicious creaminess. 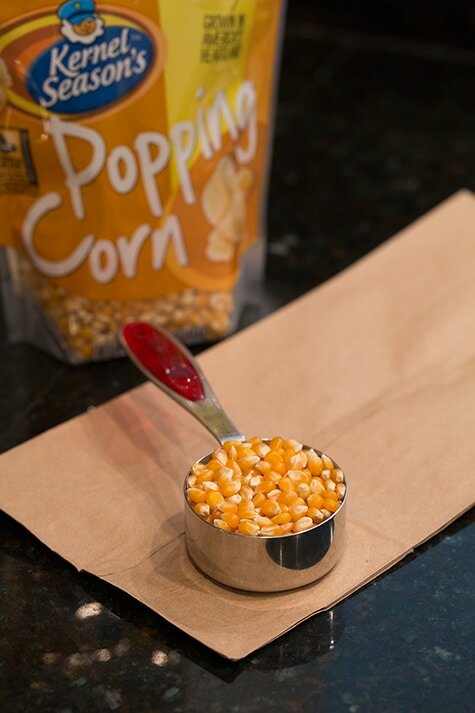 Pour popped popcorn into two large mixing bowls or 1 giant mixing bowl. In a medium saucepan combine brown sugar, butter, corn syrup and 1/2 tsp of the sea salt. Bring mixture to a boil over medium-high heat, stirring constantly. Once it reaches a boil, add sweetened condensed milk, then return to a boil and cook mixture, stirring constantly, until it reaches 236 – 238 degrees on a candy thermometer. Remove from heat and stir in vanilla then stir in 1 tsp of the fine sea salt. 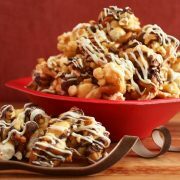 Drizzle half of the caramel over popcorn then toss several times and drizzle in remaining caramel and toss, sprinkling in remaining 1/2 tsp salt during tossing and toss popcorn until evenly coated with caramel. This is also the kind that you can shape into popcorn balls and wrap up in individual packages. It makes a huge batch, but I have the feeling you’ll be glad it does. Trust me, this stuff is unbelievably addictive. We were eating it all day long. There’s no stopping when it’s around. Below I’ve shared instructions on how to pop popcorn in a brown paper bag. We are temporarily living in D.C. and I left my popcorn popper at our other home, so I was excited to try out this incredibly easy method. 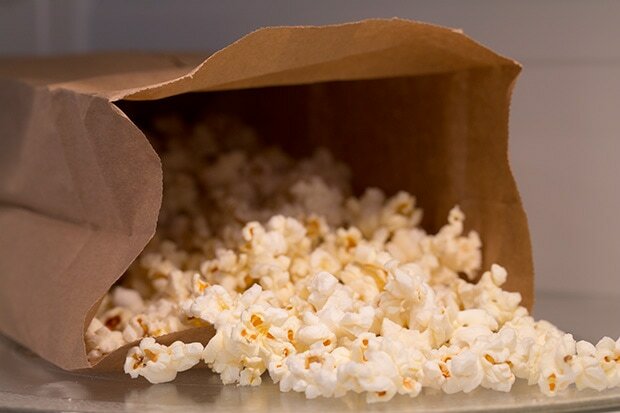 All you need it popcorn kernels and the paper lunch bags and you are minutes away from delicious popcorn that has no artificial flavoring or strange ingredients. Enjoy! More Treat Recipes You’ll Love! 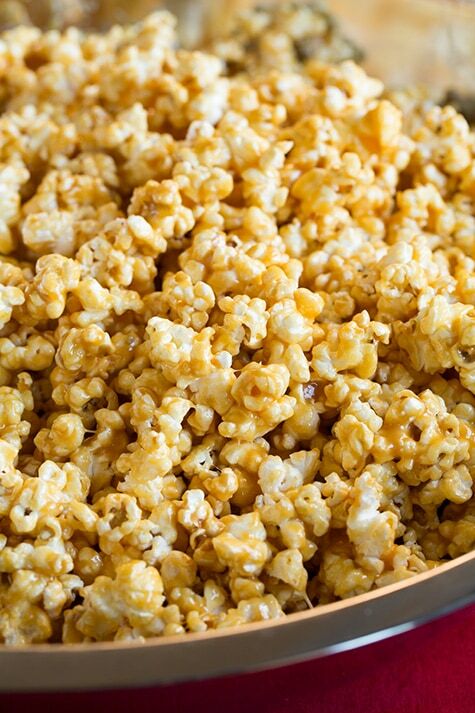 Caramel Popcorn is one of the greatest parts of the holidays! It's the ultimate party snack food and the perfect gift to share with others as it's basically guaranteed to be thoroughly enjoyed. This version is chewy, perfectly sweet and nicely balanced with hints of salt. Pour popped popcorn into two large mixing bowls or 1 giant mixing bowl. In a medium saucepan combine brown sugar, butter, corn syrup and 1/2 tsp of the sea salt. Bring mixture to a boil over medium-high heat, stirring constantly. Once it reaches a boil, add sweetened condensed milk, then return to a boil and cook mixture, stirring constantly, until it reaches 236 - 238 degrees on a candy thermometer. Remove from heat and stir in vanilla then stir in 1 tsp of the fine sea salt (you can also stir in remaining 1/2 tsp sea salt or reserve to sprinkle over popcorn, whichever you prefer). 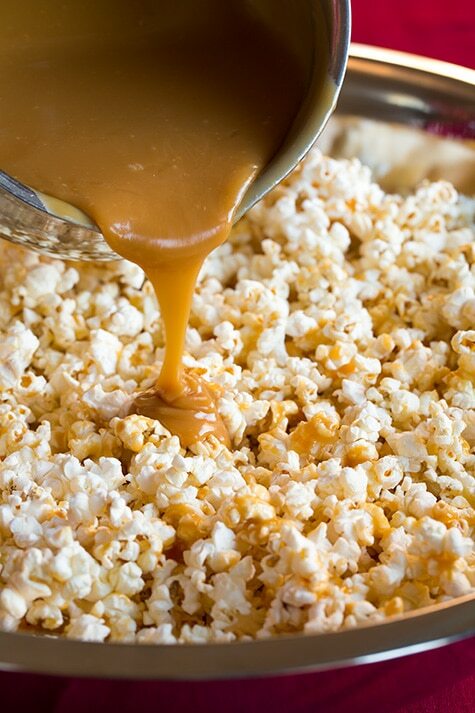 Drizzle half of the caramel over popcorn then toss several times and drizzle in remaining caramel and toss, sprinkling in remaining 1/2 tsp salt (or to taste) during tossing and toss popcorn until evenly coated with caramel. Allow to cool then store in airtight containers. 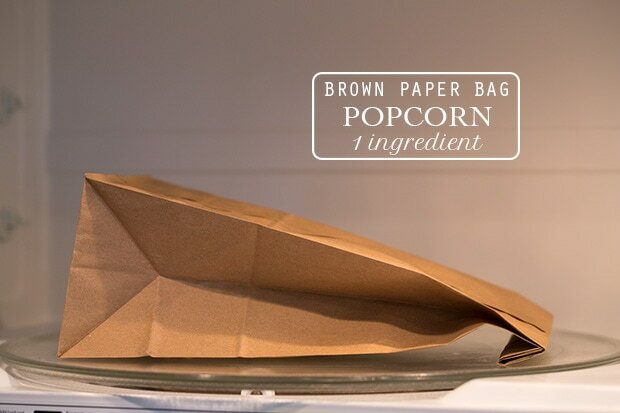 Add kernels to a brown paper lunch bag. Fold top of bag down twice (about 3/4-inch folds. Do not tape or staple). Place bag in microwave and heat on HIGH power until popping begins to slow (about 2 second interval between pops), about 2 – 2 1/2 minutes depending on microwave wattage. Remove and season as desired (for the caramel pocpo recommend clarified butter and salt. For instructions on how to make clarified butter see link here). Dru: Thanks for sharing! One question: I live abroad (in Thailand), and corn syrup is very hard to come by. I’ll experiment with your recipe, but do you have any suggestions for substituting the corn syrup for something else? What if I make a thick cane sugar syrup in advance?